In Las Vegas it was tragedy after tragedy. 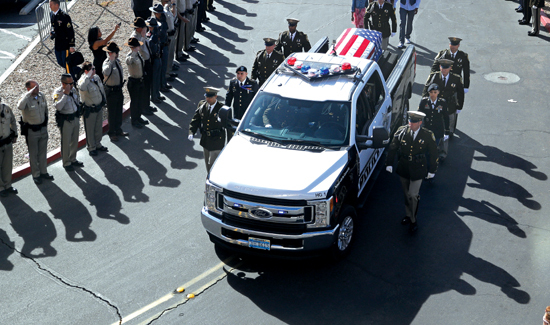 A Las Vegas police officer and U.S. Army veteran who was among 58 people killed in the worst mass shooting in modern U.S. history was laid to rest in Nevada. Las Vegas Police Officer Charleston Hartfield’s mother died just two days after her son’s funeral. A broken heart was not the official cause of death but that’s what family members say killed her. Officer Hartfield, a military veteran and widely respected police officer, had left notes on his computer for friends and loved ones in the event of his untimely death. “If you’re reading this, then I’ve been called home,” read the note that Charleston Hartfield began about a year ago. Senior Central Christian Church Pastor Mike Bodine said the notes were discovered by Hartfield’s wife, Veronica. More than 2,000 people attended the officer’s funeral and Pastor Bodine told the mourners about what Hartfield said in the notes. A thoughtful and humble person, Hartfield managed to show what a caring human being he was in life—even after his death. Police and military officials including Brig. Gen. Zachary Doser, the head of the Nevada Army National Guard, said that the man everyone knew as “Chucky” was an inspirational mentor, a really funny guy, and the kind of person people generally hope their kids grow up to be like. Brig. Gen. Doser talked about Hartfield’s impressive military record. By the age of 34 Hartfield had put in 17 years of military service between Iraq and with a quartermaster unit in the Nevada Guard. Hartfield was posthumously promoted to first sergeant in the Army Reserve. Clark County Sheriff Joe Lombardo described Hartfield’s heroism on the night of the worst mass shooting in U.S. history. “That night, in a hail of gunfire, Charlie’s last actions spoke for him,” Lombardo said. Those watching the funeral procession saluted and some were visibly weeping as more than 50 police motorcycles with lights flashing led a police pickup truck bearing Hartfield’s flag-draped casket. Brig. Gen. Doser was riding in the funeral procession. He said the image and memory of a woman standing alone with a rose in one hand and her other hand over her heart will stay with him for the rest of his days.